Kagoshima prefecture is located at the southern tip of the Japanese archipelago on the island of Kyushu, in close proximity to north-east Asia. We aim to establish Kagoshima as the southern gateway of Japan to Asia and the rest of the world. 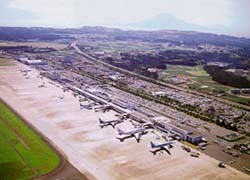 Kagoshima airport has 17 domestic and 4 international air routes, with the domestic flights operating between major cities including Tokyo, Nagoya, Osaka and Fukuoka, and international flights operating between Shanghai (China), Seoul (South Korea), Hong Kong, and Taipei (Taiwan). 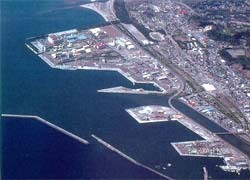 According to the national project that the proposes to create international marine container terminals countrywide, Shibushi Port is recognized as the key international core port in Kyushu. Regular container lines are being established from Shibushi to China, Taiwan and Hong Kong. Shibushi Port also has domestic lines to Tokyo, Osaka and Okinawa. This is the base port for domestic and foreign distribution with ferry network. Japan’s highways begin in Kagoshima, the country’s southernmost point. 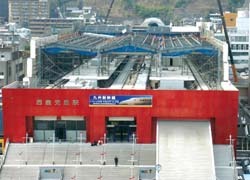 Presently, Kagoshima is working towards expanding the Kyushu Shinkansen (bullet train) in order to put the Kagoshima Route in service from the terminal station Nishi-Kagoshima in 2004. Steps are also being taken to improve existing highways making ground transportation from Shibushi Port faster.